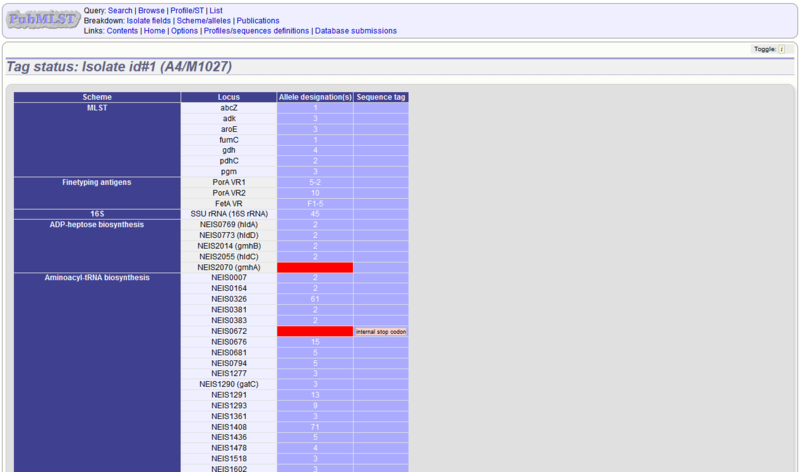 Select the alleles that you would like to include in the analysis. 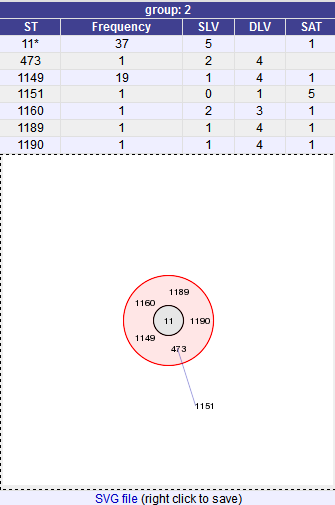 Variable length loci are limited to 200 sequences or fewer since these need to be aligned. 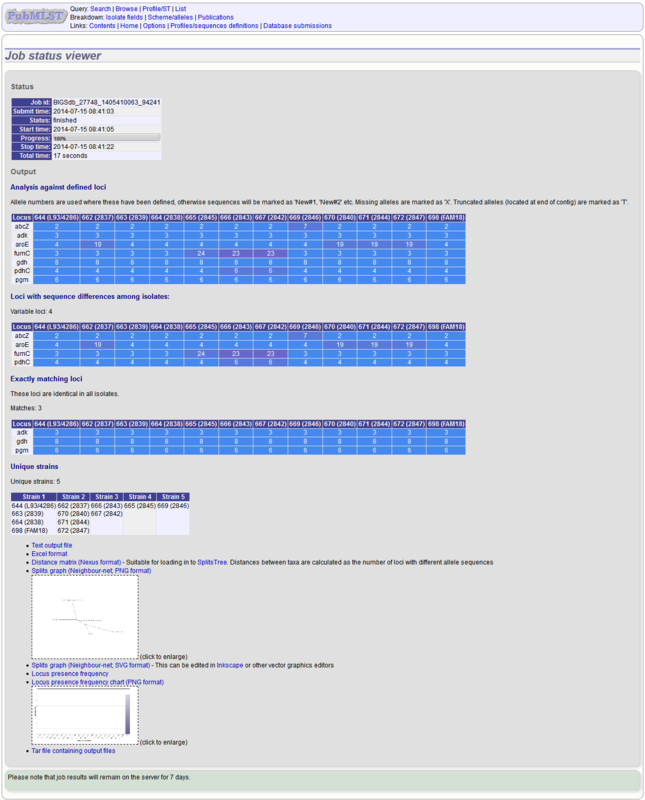 Click ‘Polymorphic sites’. 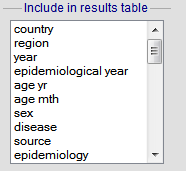 The values used to generate the chart can be displayed or extracted by clicking the ‘Display table’ link at the bottom of the page. Click submit. 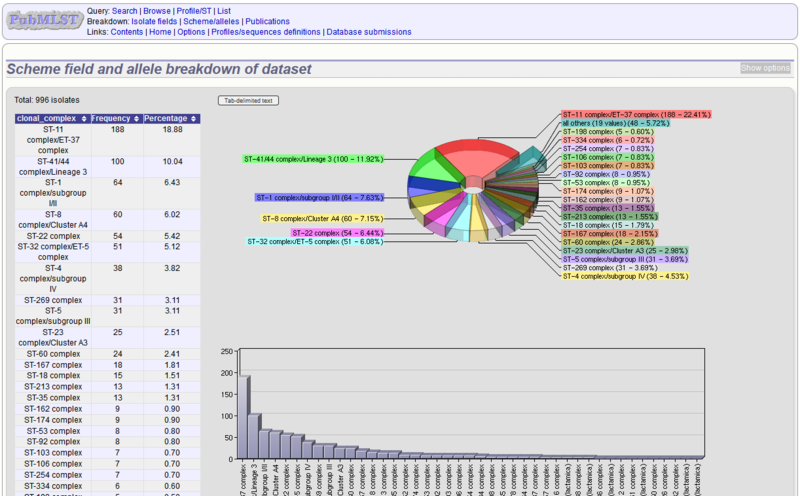 The breakdown will be displayed as a table. 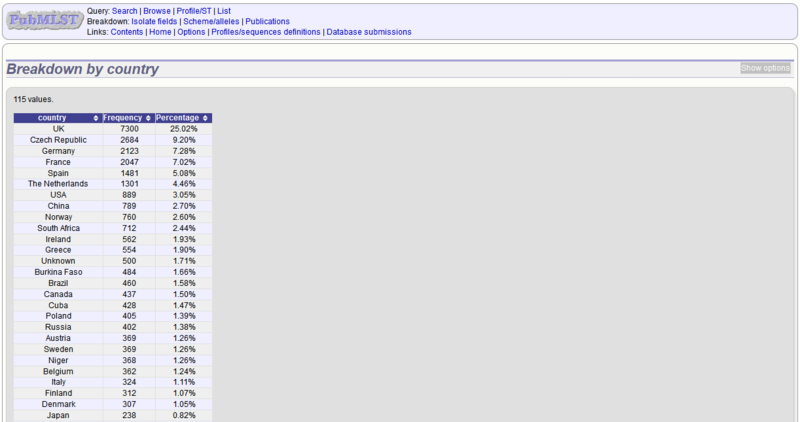 Bar charts will also be displayed provided the number of returned values for both fields are less than 30. A scheme tree is shown. 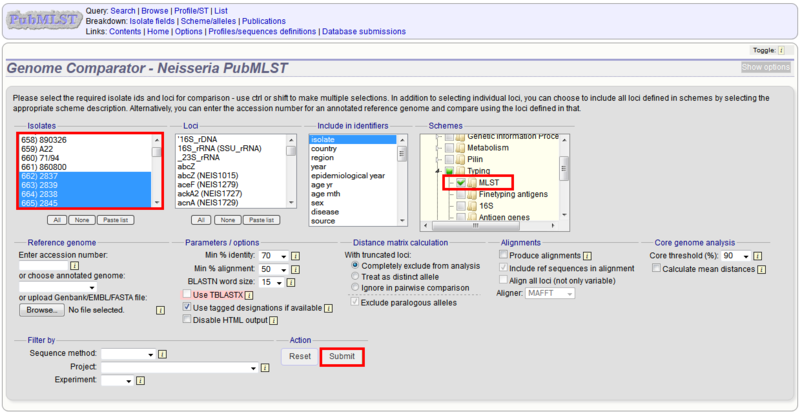 Select any combination of schemes to analyse. Select the isolate records to analyse - these will be pre-selected if you accessed the plugin following a query. Click submit. 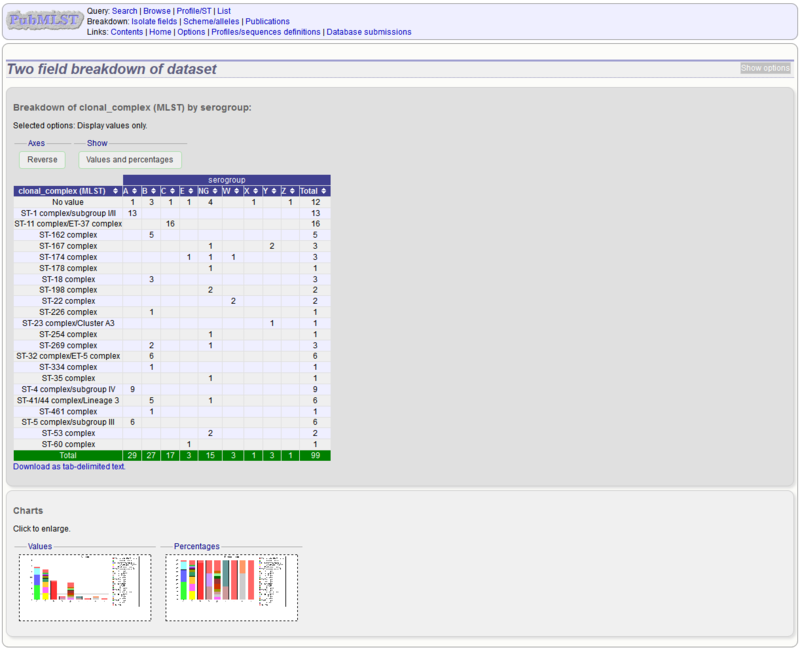 Select the isolate genomes that you wish to analyse and then either the loci from the list or a set of schemes. Press submit. 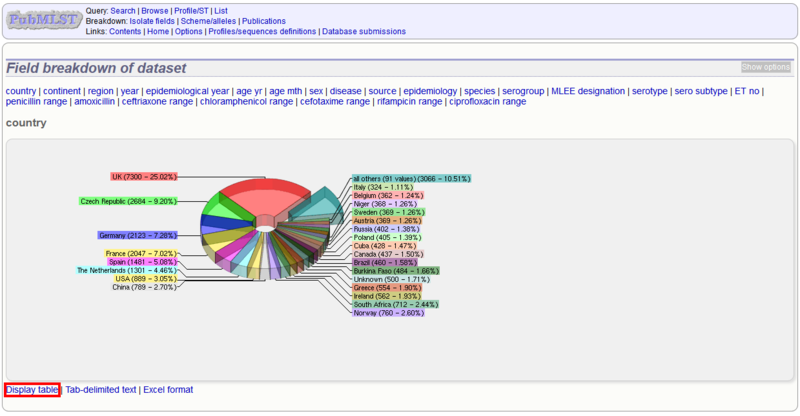 This selection box allows you to choose which isolate provenance fields will be included in the results table and sequence exports. BLASTN word size - This is the length of the initial identical match that BLAST requires before extending a match (default: 15). Increasing this value improves speed at the expense of sensitivity. The default value gives good results in most cases, but increasing this to 20 is almost as good (there was 1 difference among 2000 loci in a test run) and will speed up the analysis approximately two-fold. 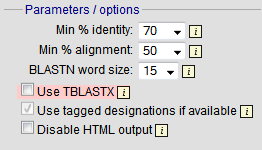 Use TBLASTX - This compares the six-frame translation of your nucleotide query sequence against the six-frame translation of the contig sequences. Sequences will be classed as identical if they result in the same translated sequence even if the nucleotide sequence is different. This is significantly slower than using BLASTN. 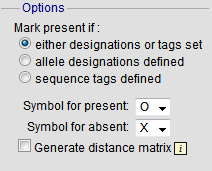 Use tagged designations - When analysing using defined loci, Genome Comparator can use the designations stored within the database (this is the default). 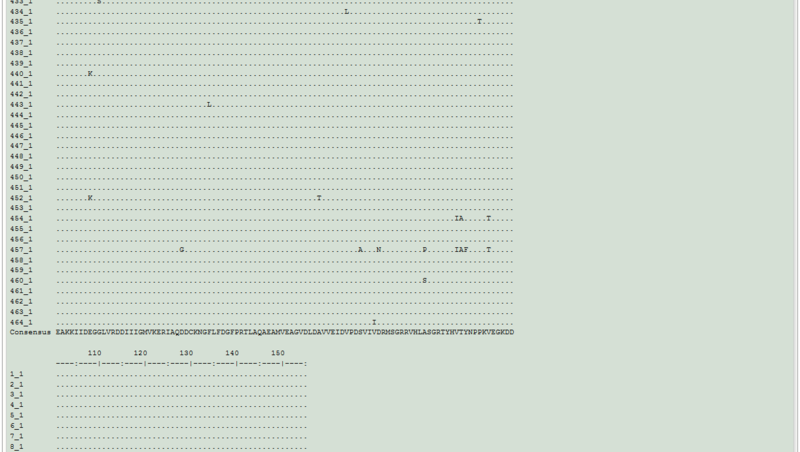 This is much quicker since it doesn’t need to run BLAST against these sequences. If a designation is missing, BLAST will be run for that locus anyway. 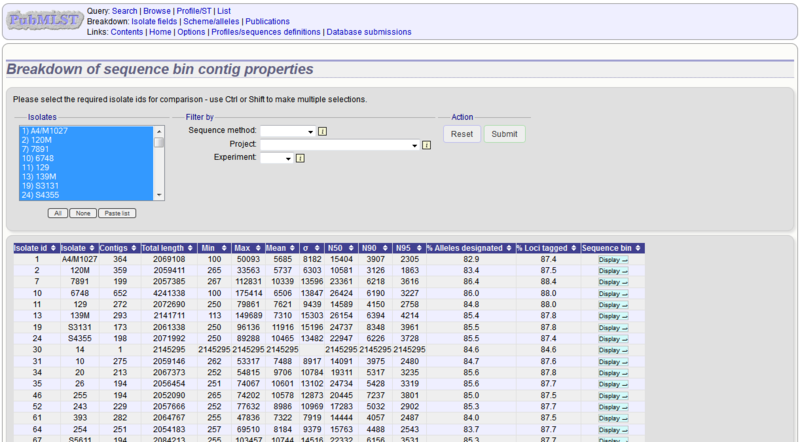 Disable HTML output - If running Genome Comparator against a large number of genomes, the resulting table may get so large that your web browser struggles to render it properly and may use up too much memory on your computer. Clicking this button prevents this output - this output is not required for further analysis since everything present in it is also generated in Excel format at the end. 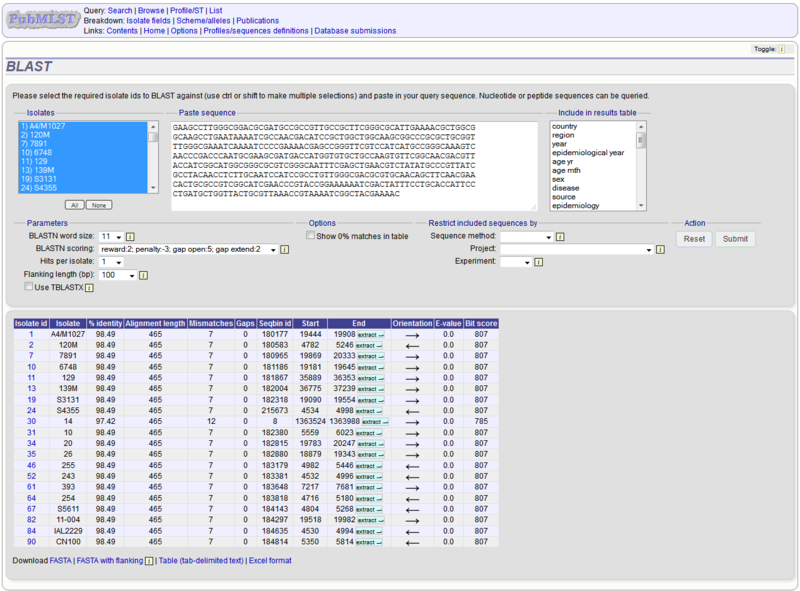 HTML output is automatically disabled when more than 150 genomes are analysed. 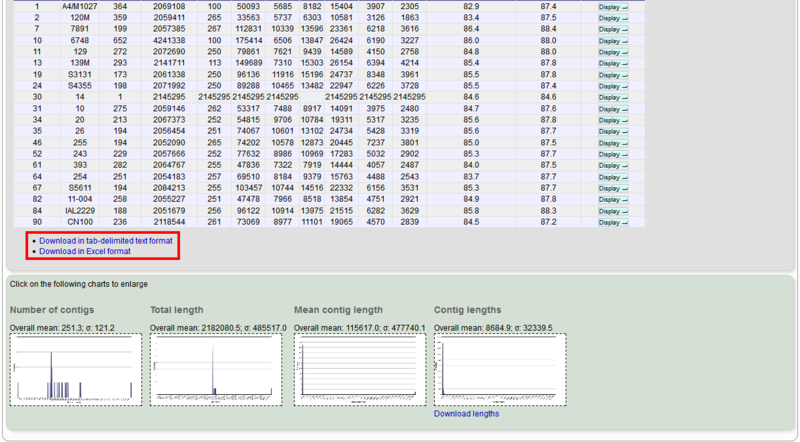 This section provides options for the treatment of truncated and paralogous loci when generating the distance matrix. 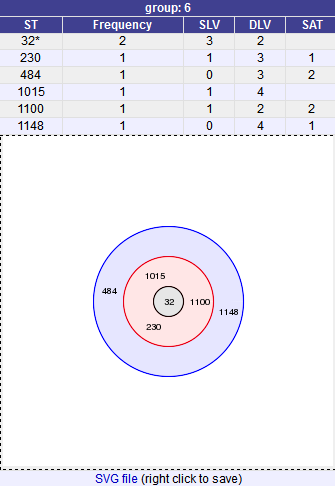 Completely exclude from analysis - Any locus that is truncated in at least one isolate will be removed from the analysis completely (default). 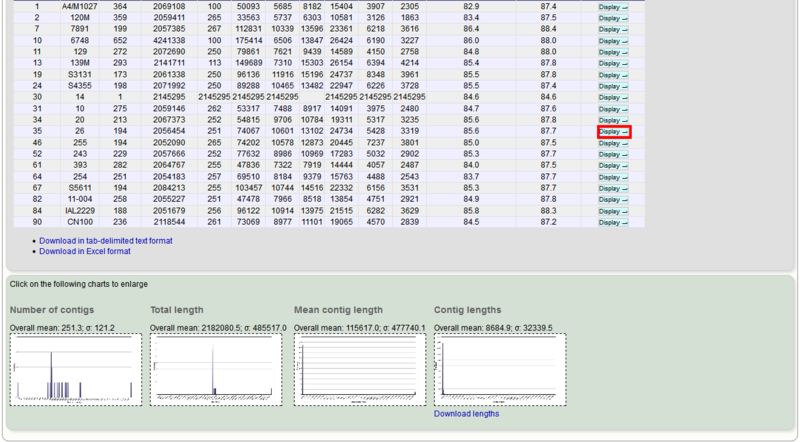 Using this option means that if there is one bad genome with a lot of truncated sequences in your analysis, a large proportion of the loci may not be used to calculate distances. 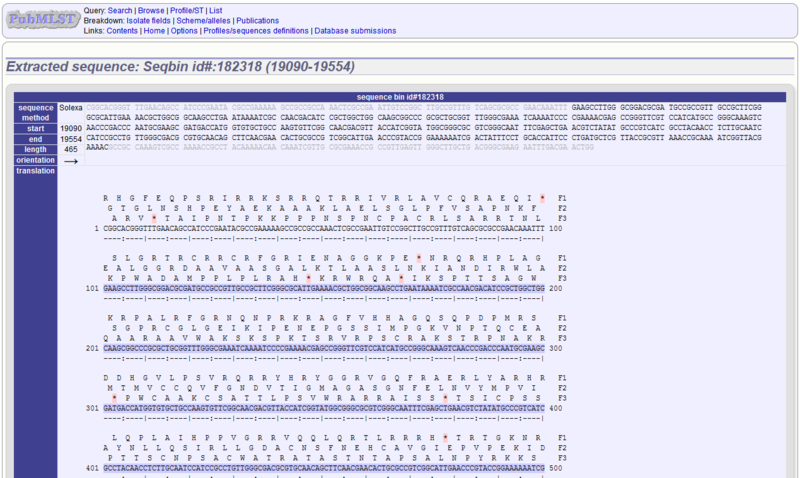 Treat as a distinct allele - This treats all truncated sequences as a specific allele ‘T’. 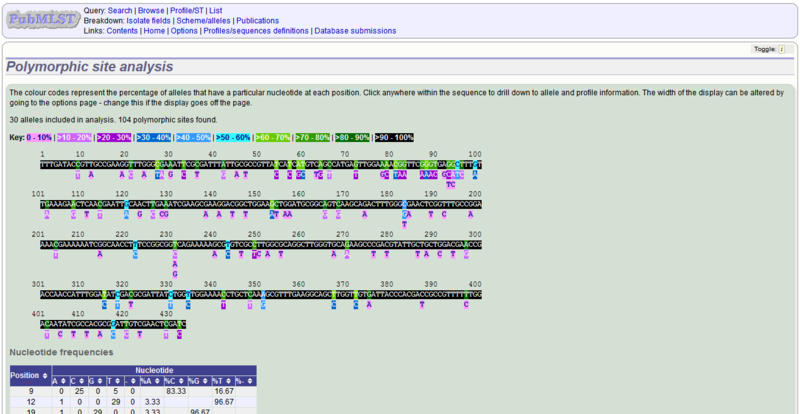 This varies from any other allele, but all truncated sequences will be treated as though they were identical. Ignore in pairwise comparison - This is probably the best option (and will likely become the default). 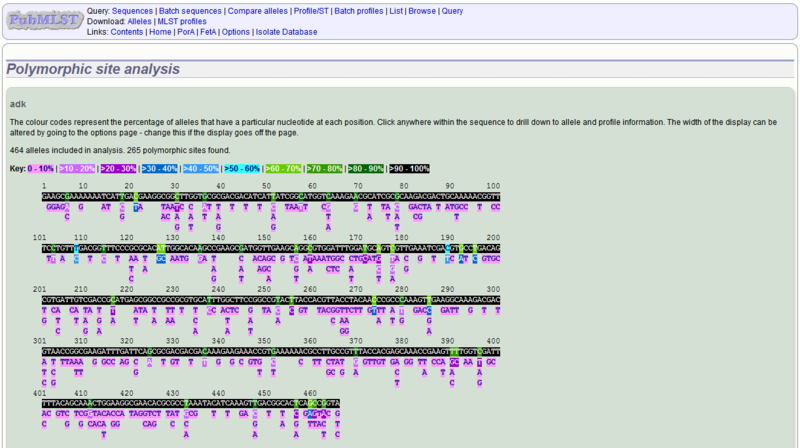 In this case, truncated alleles are only excluded from the analysis when comparing the particular isolate that has it. Other isolates with different alleles will be properly included. 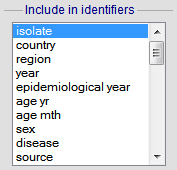 The affect of this option will be to shorten the distances of isolates with poorly sequenced genomes with the others. Paralogous loci, i.e. 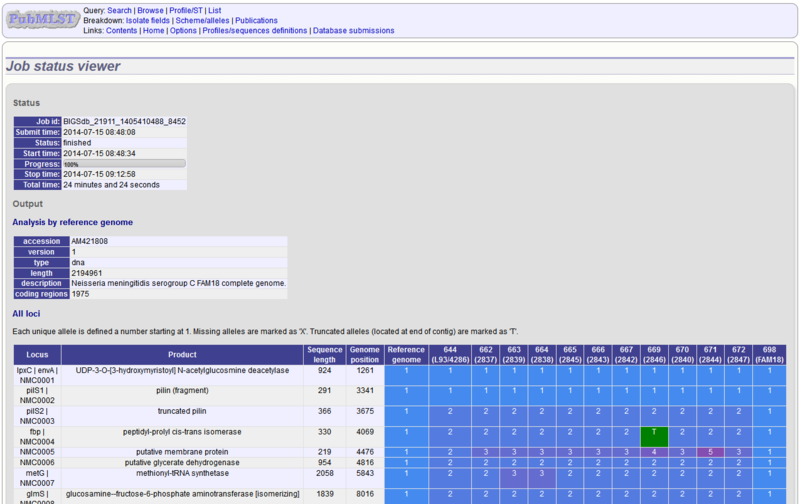 those with multiple good matches, can be excluded from the analysis (default). This is the safest option since there is no guarantee that differences seen between isolates at paralogous loci are real if the alternative matches are equally good. 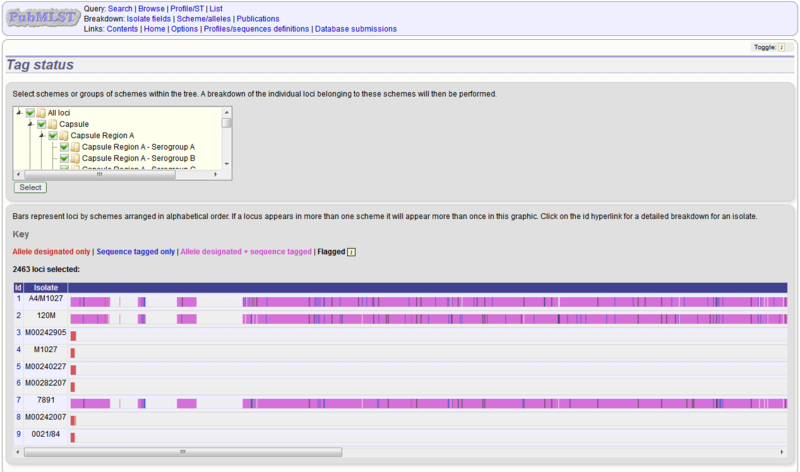 Produce alignments - Selecting this will produce the alignment files, as well as XMFA and FASTA outputs of aligned sequences. This will result in the analysis taking approximately twice as long to run. MUSCLE - This was originally the only choice. It is still included to enable previous analyses to be re-run and compared but it is recommended that MAFFT isused otherwise. 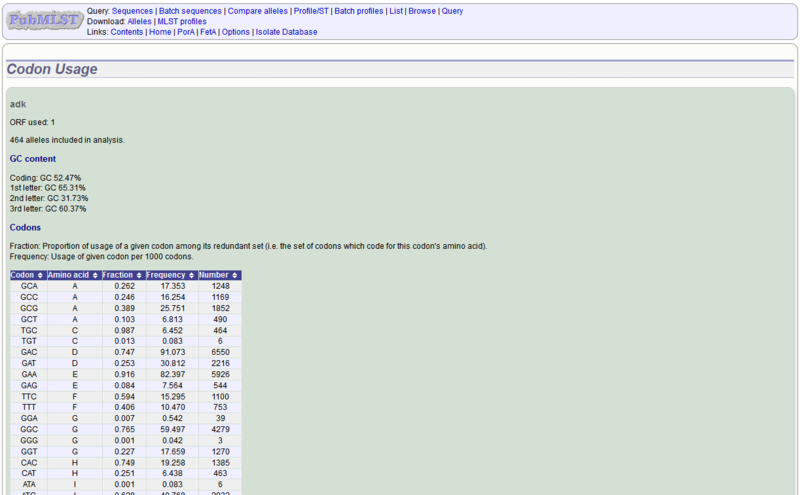 The table can be downloaded in tab-delimited text or Excel formats by clicking hte links at the bottom of the page. 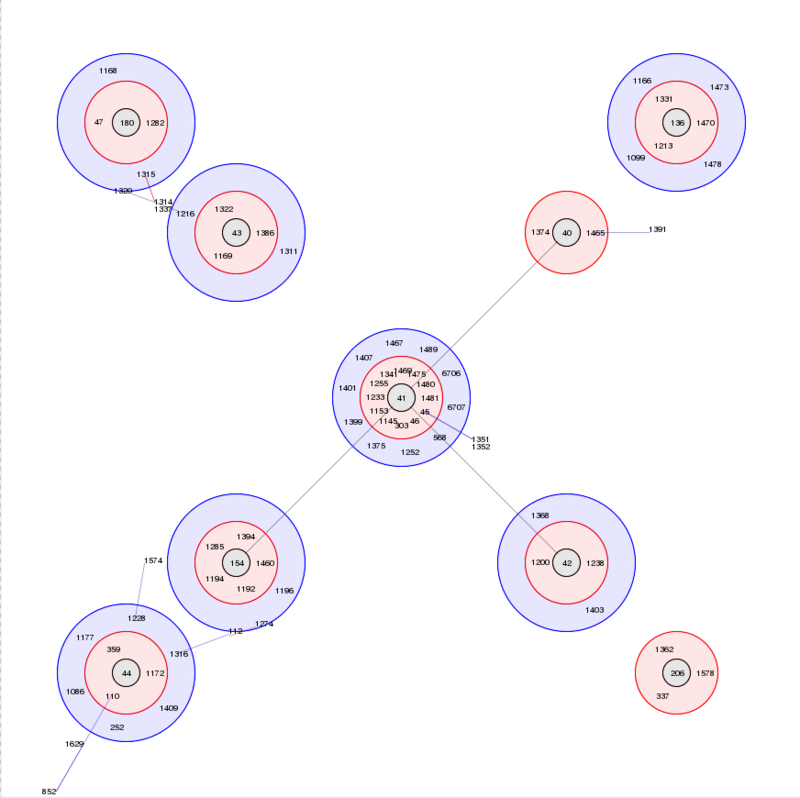 Clicking any of the isolate id hyperlinks navigates to a page that breaks down the exacty status for all loci of that isolate.